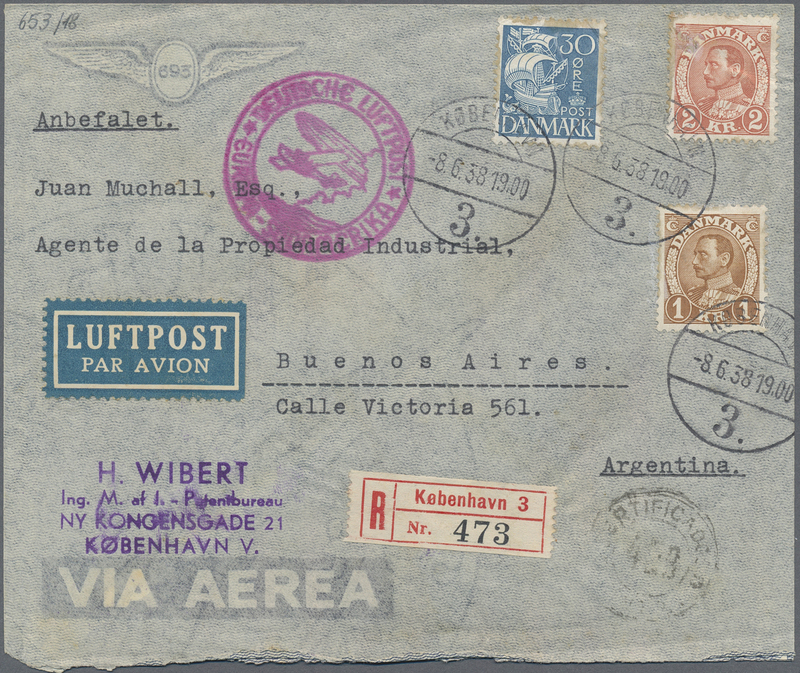 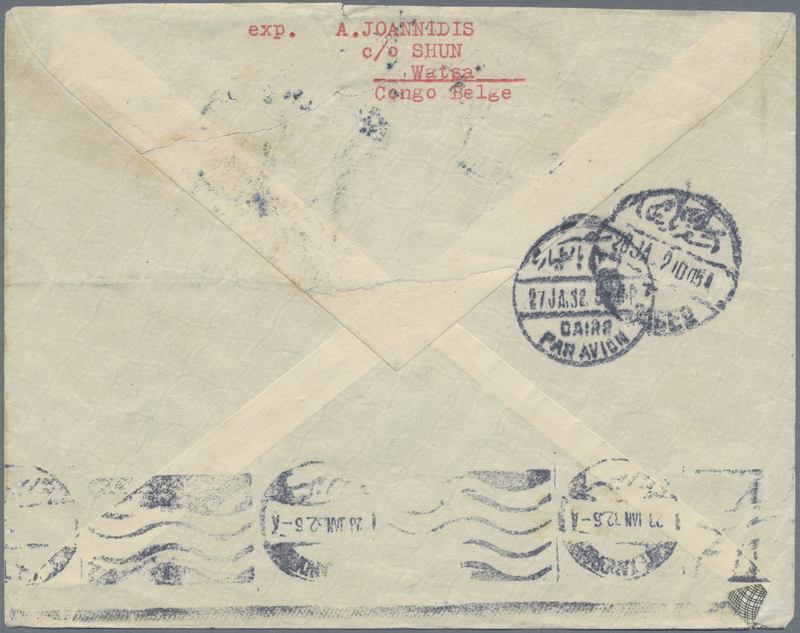 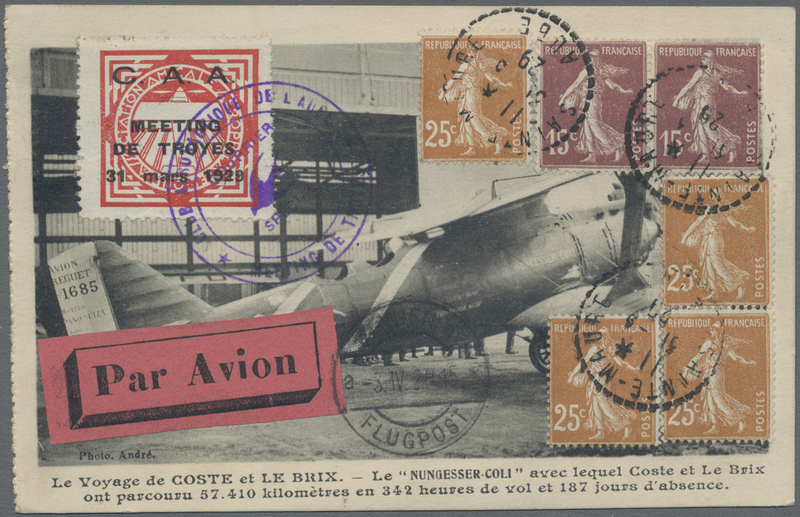 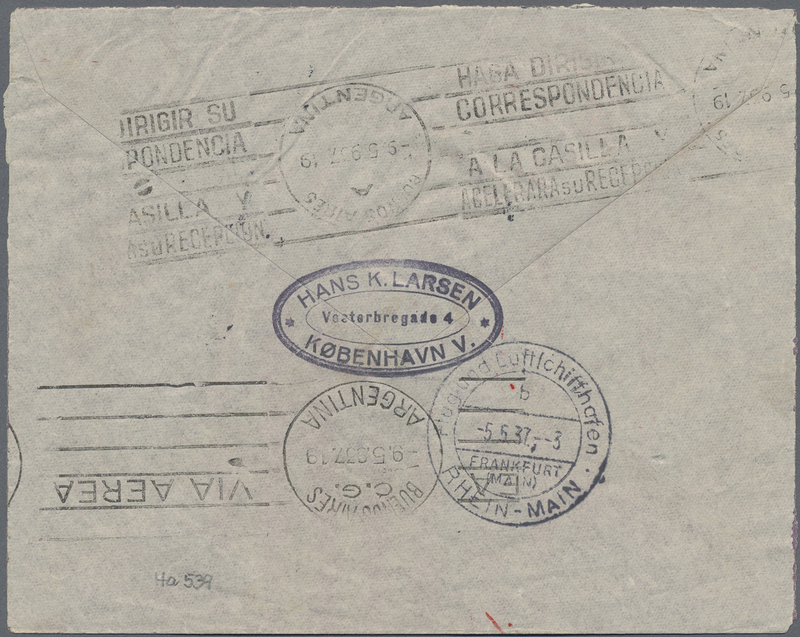 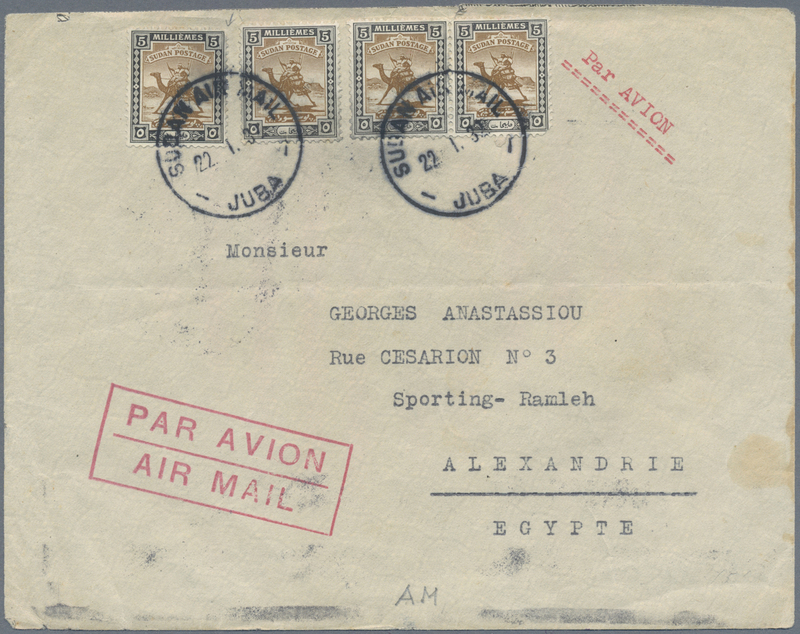 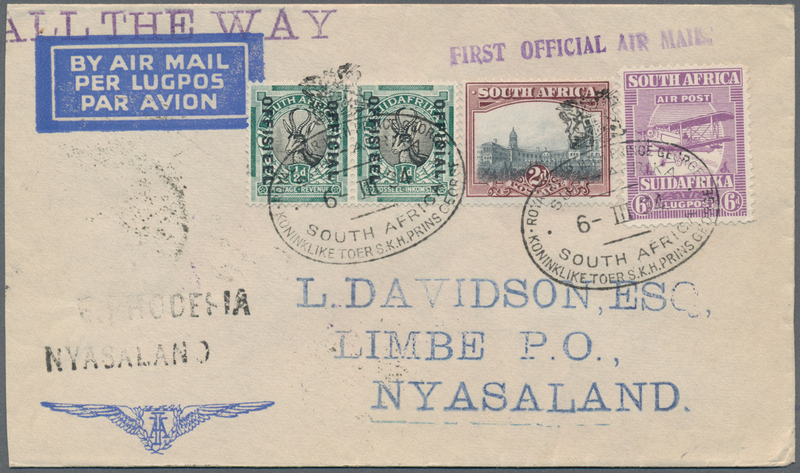 13283 Brief (cover) 1933: connecting flight Brussels/Belgium - Paris/France for First Scheduled Air Mail Service London Ragoon/Burma. 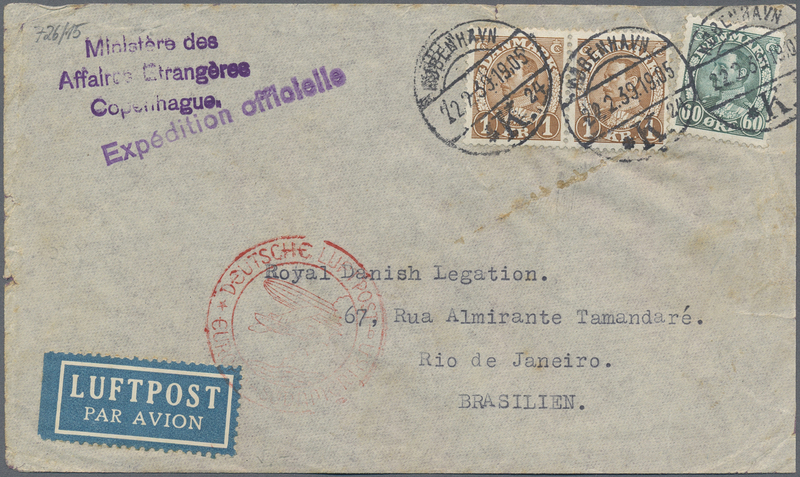 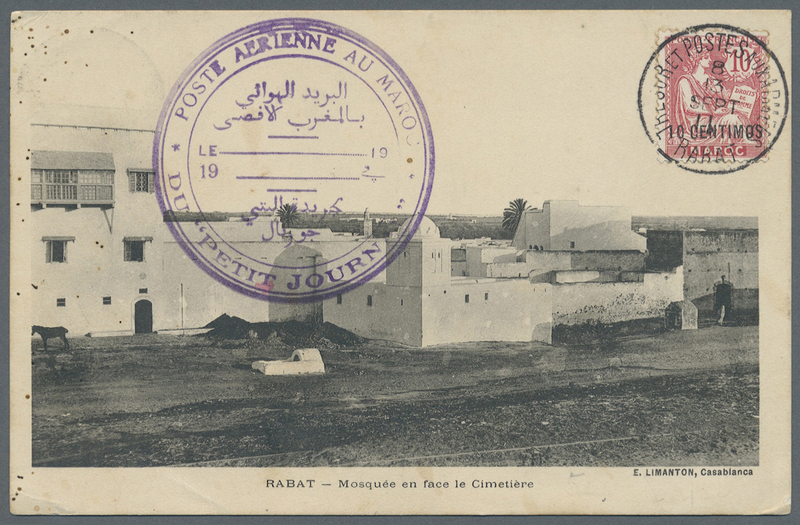 Paris transit, Ragoon arrival and confirmation on reverse. 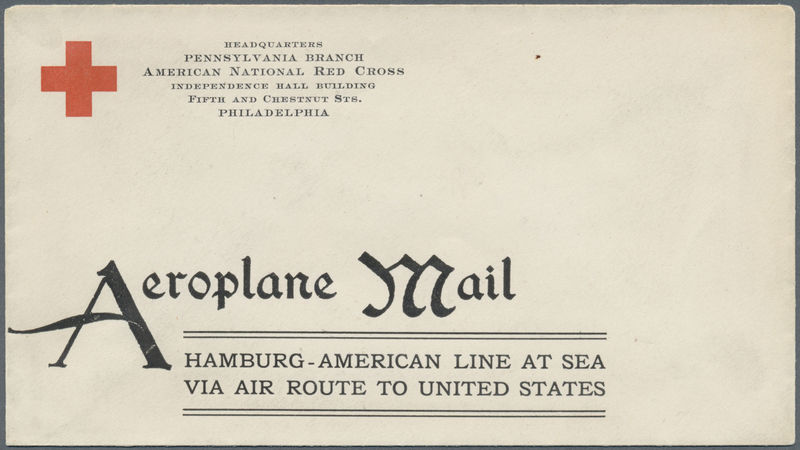 Mounted on page with extensive description. 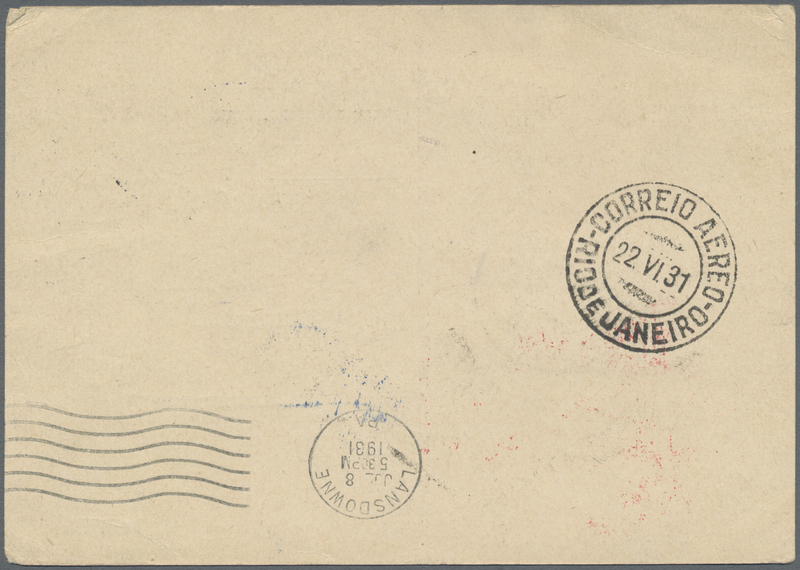 13285 Brief (cover) 1954. 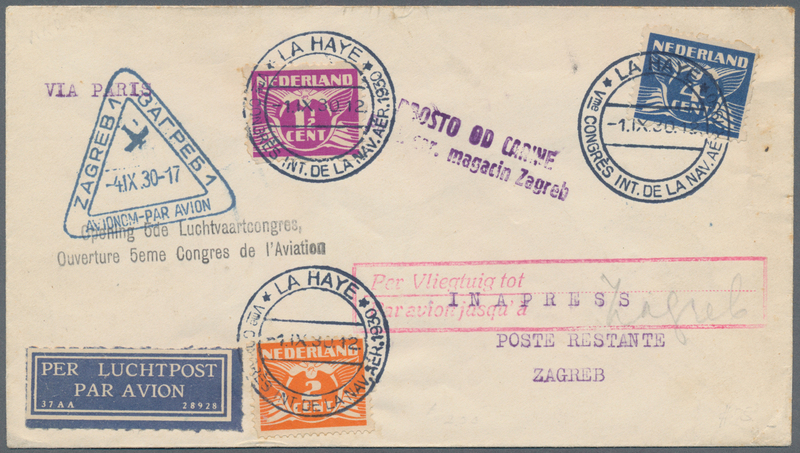 Registered first flight cover "Zurich-Geneva-Sao Paulo" from "Genève 15 Aéroport 27.5.54". 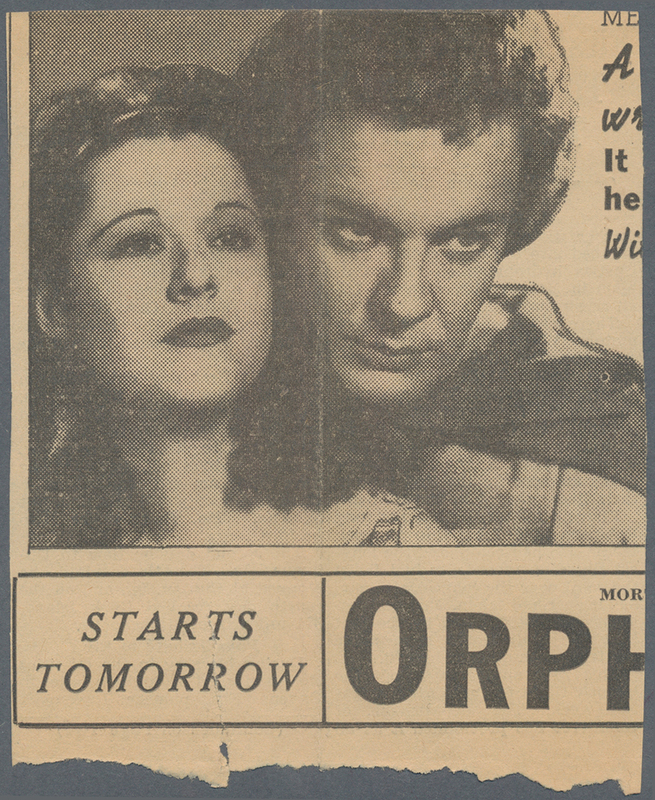 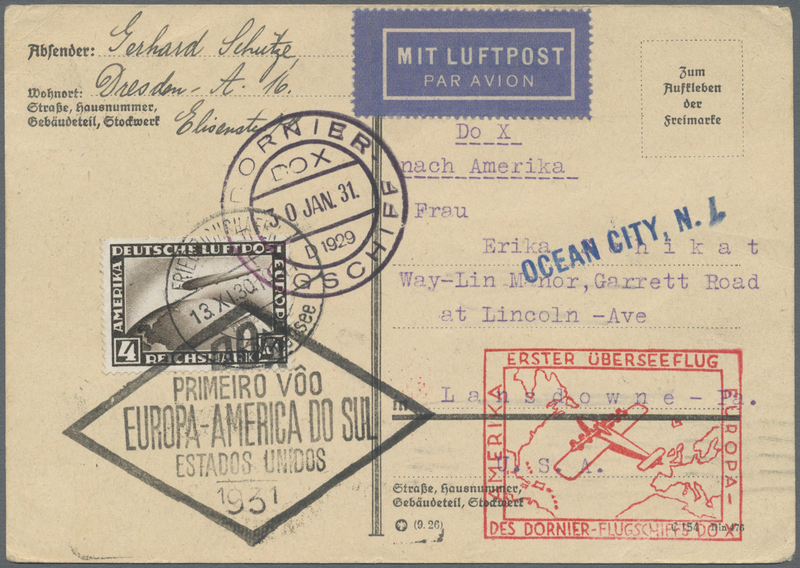 Cachet "Sao Paulo". 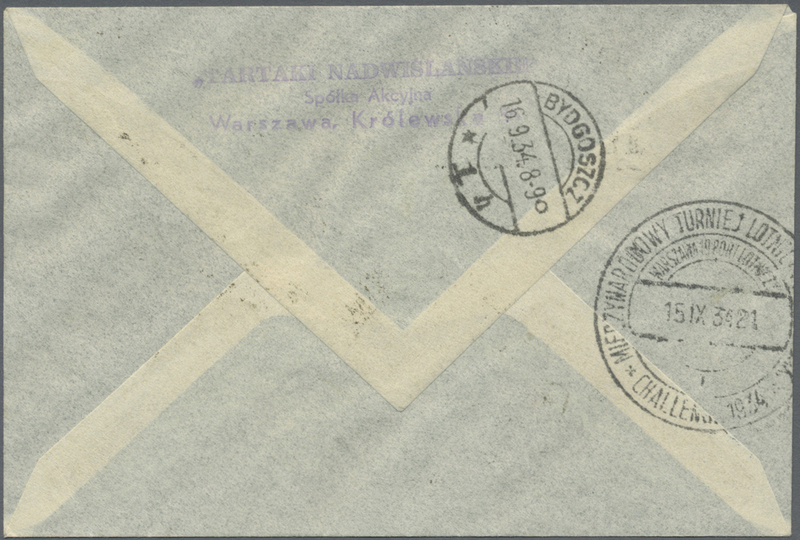 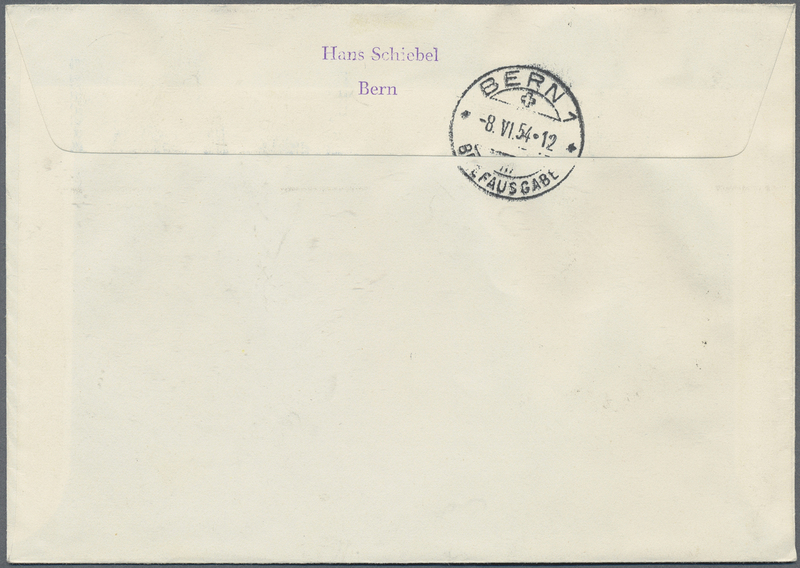 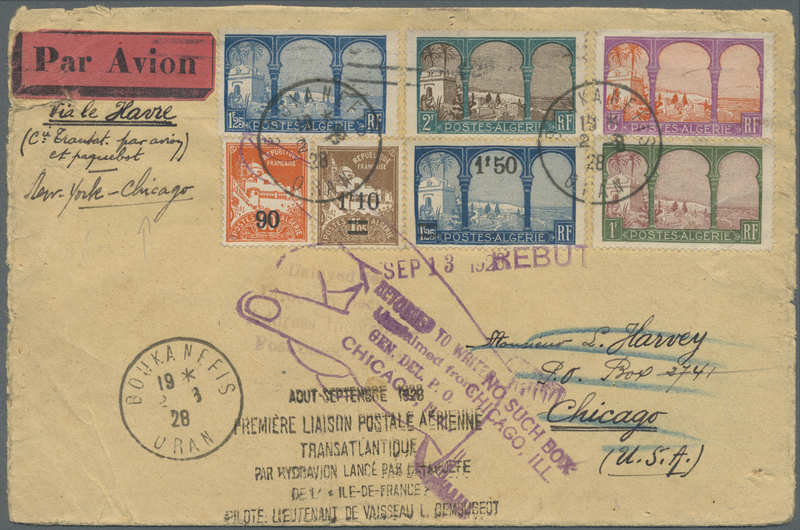 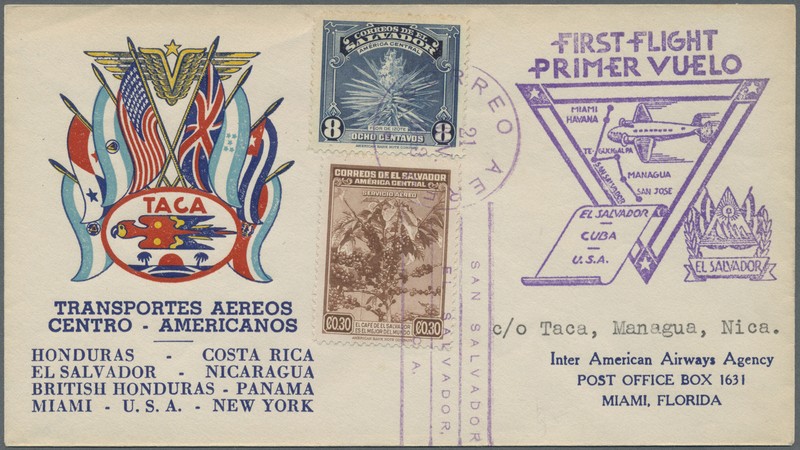 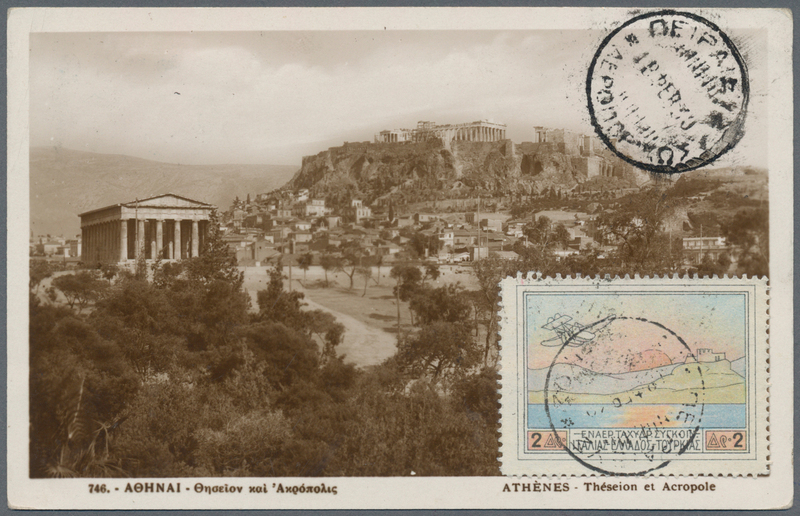 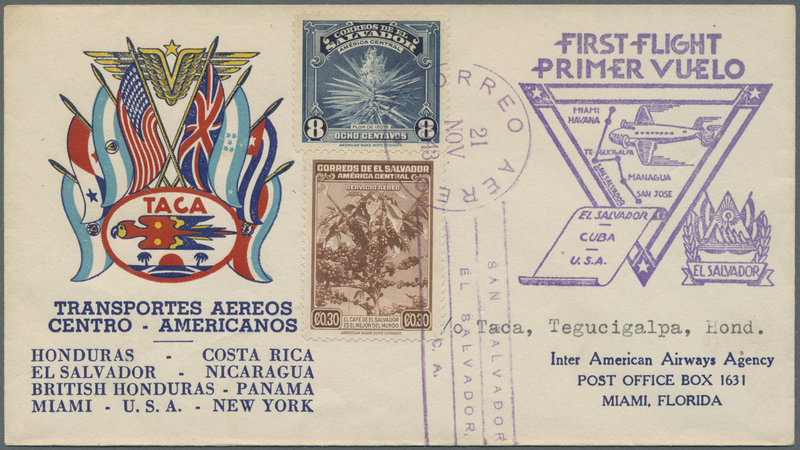 13286 Brief (cover) 1954. 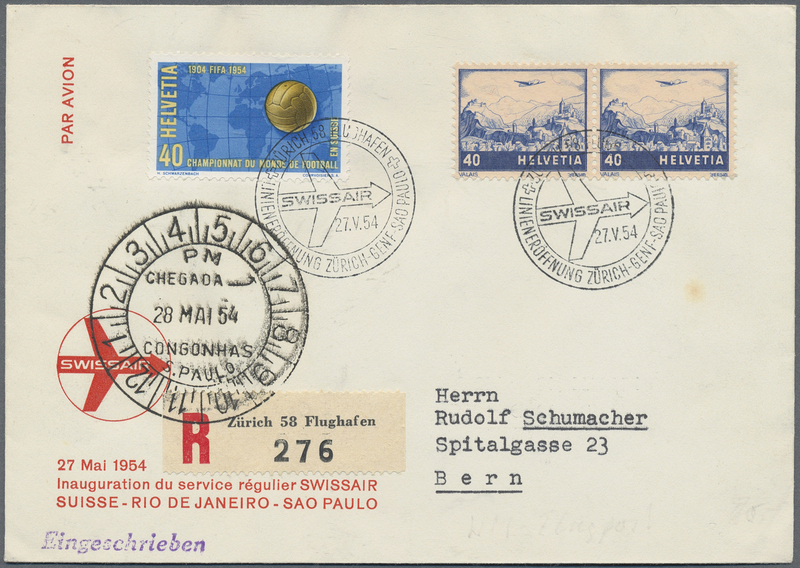 Registered first flight cover "Zurich-Geneva-Sao Paulo" from "Zürich 58 Flughafen 27.5.54". 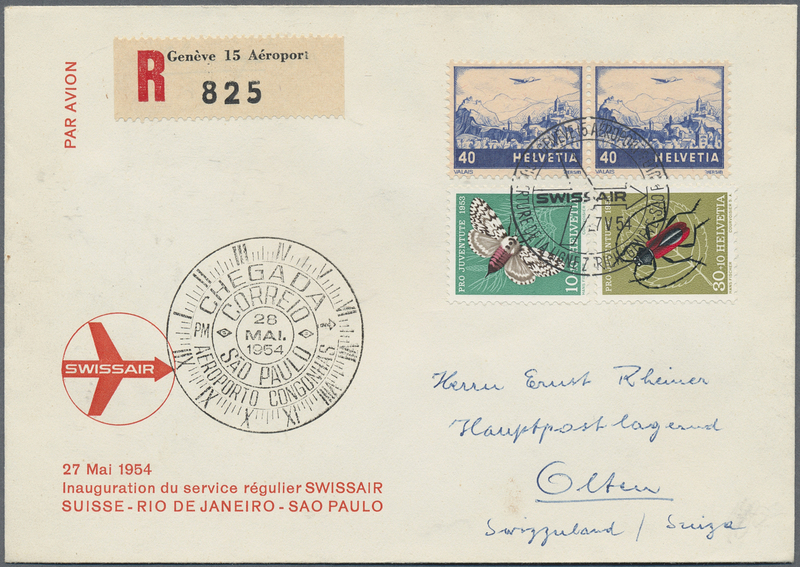 Cachet "Sao Paulo". 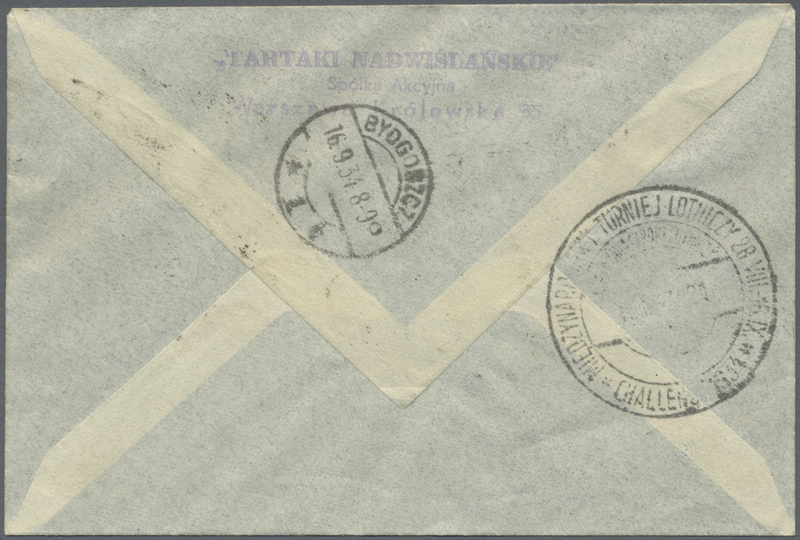 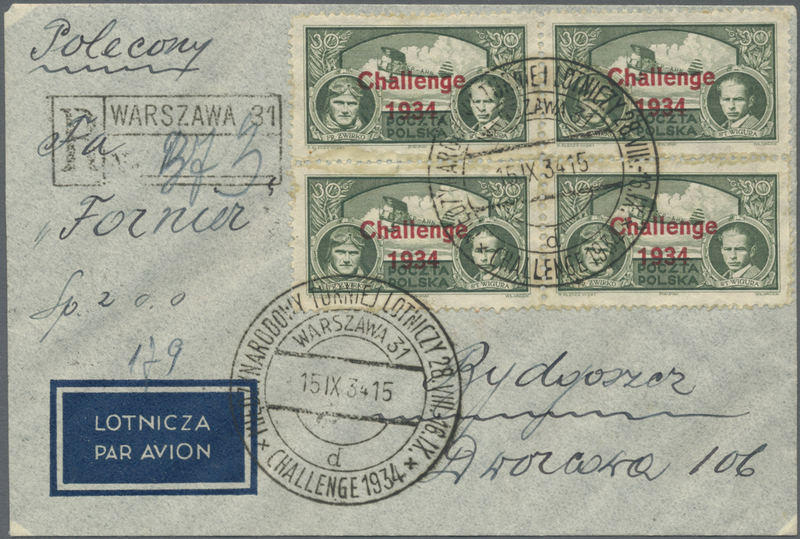 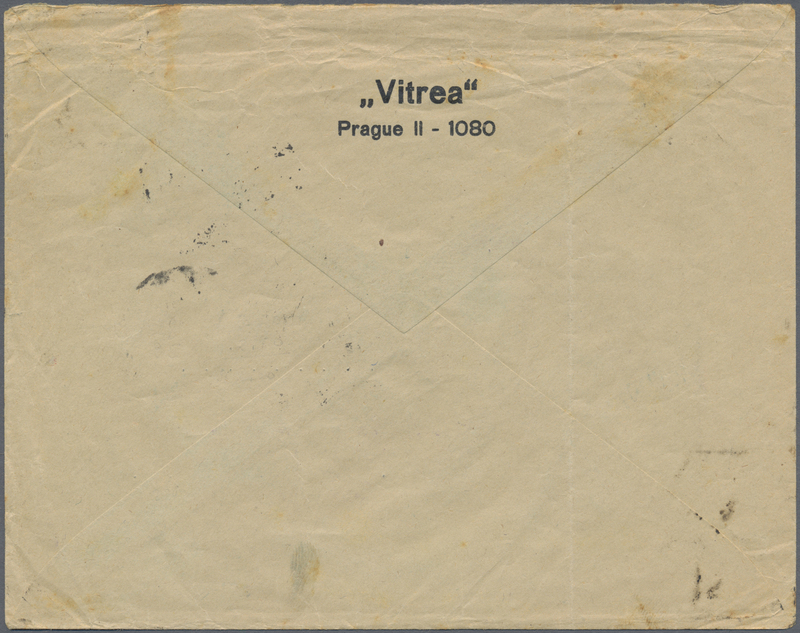 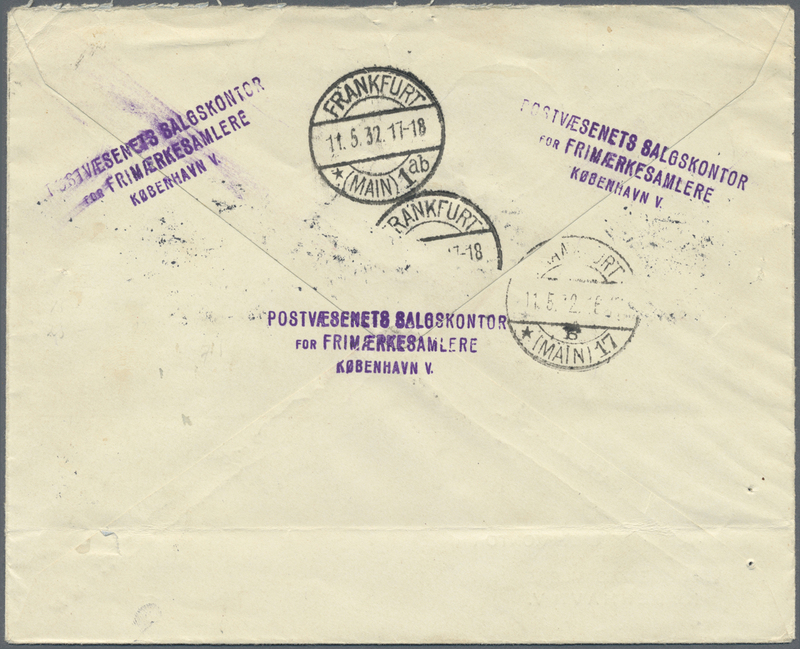 13291 Brief (cover) Czechoslovakia, 1929 (Aug. 30): Registered business envelope "Vitrea Prague" franked with consular overprinted 'A' on Scadta 30 C. resp. 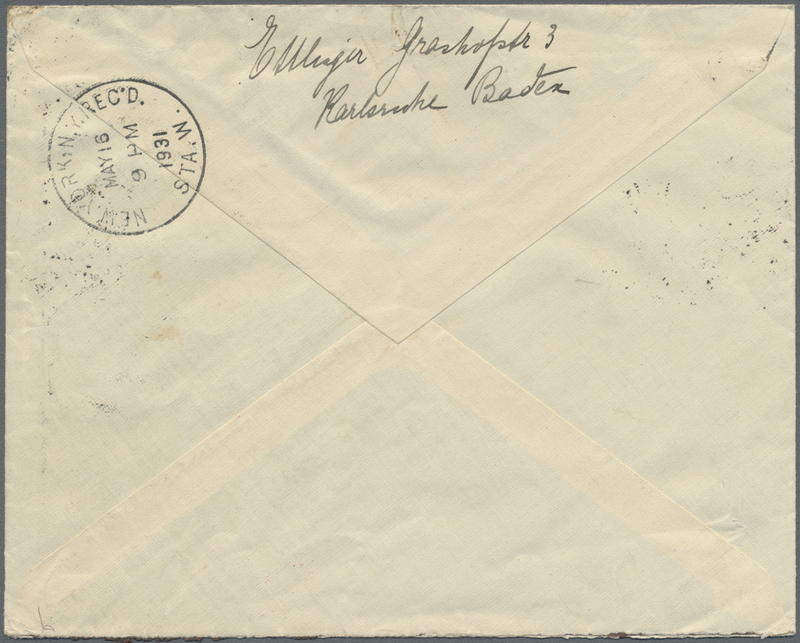 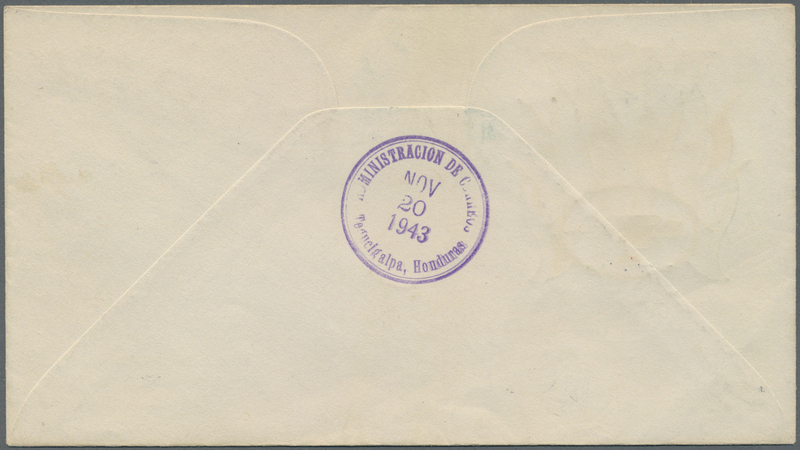 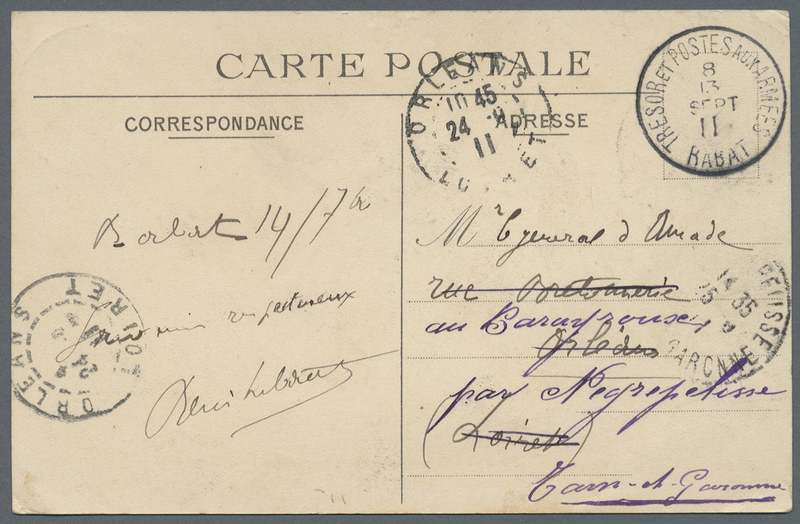 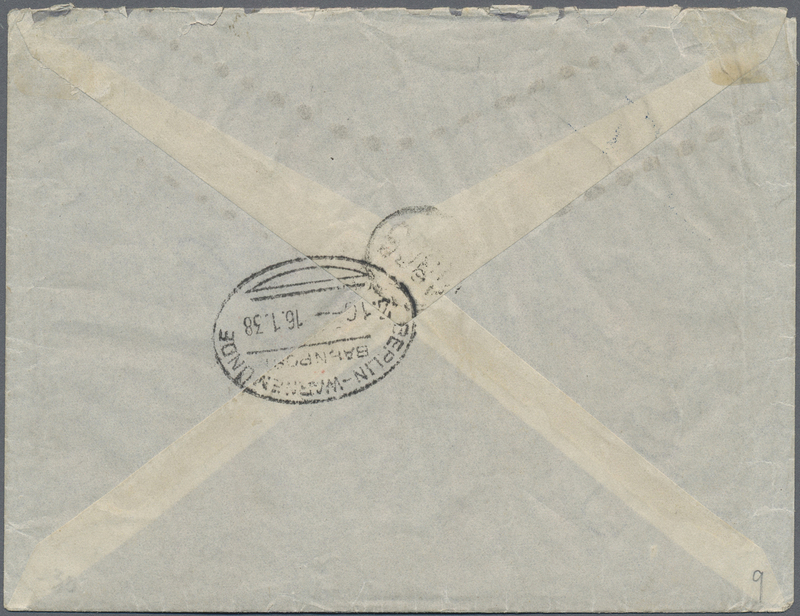 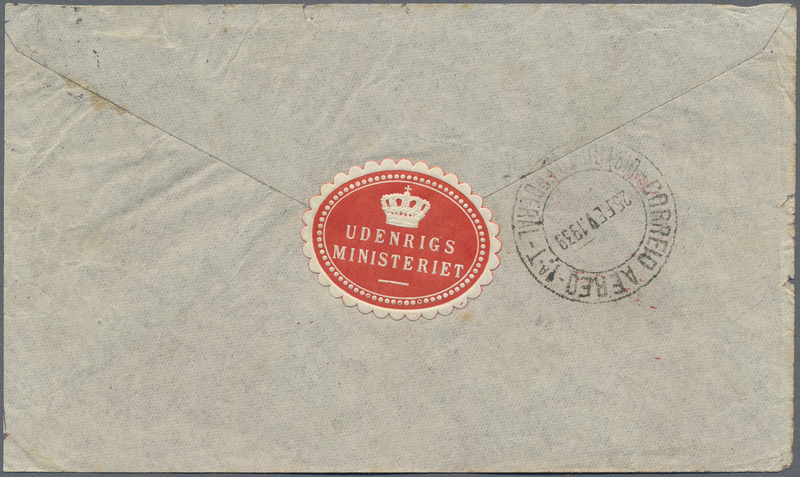 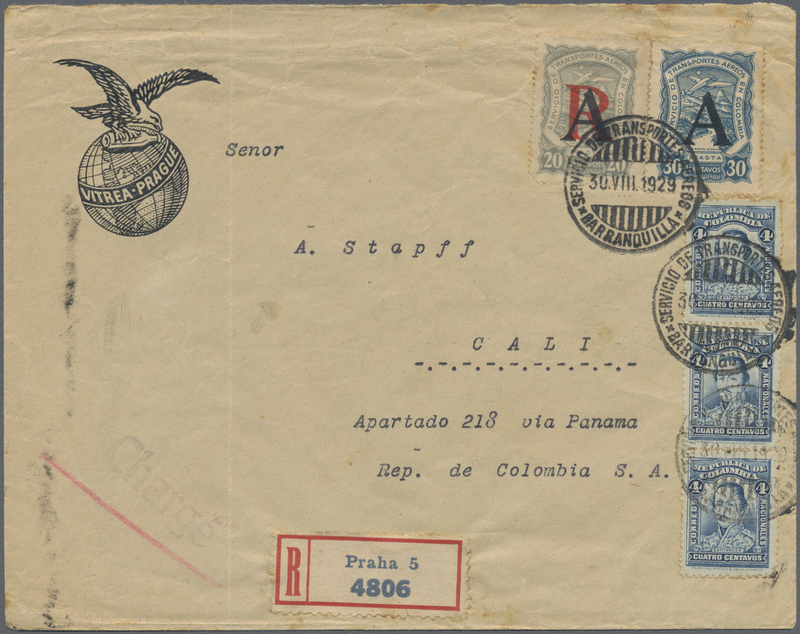 'R' over 'A' on Scadta 20 C. grey, National postage 3 x 4 c. plus registration stamp, sent under the two cover system and tied in transit by "Barranquilla30.VIII.1929" cds. 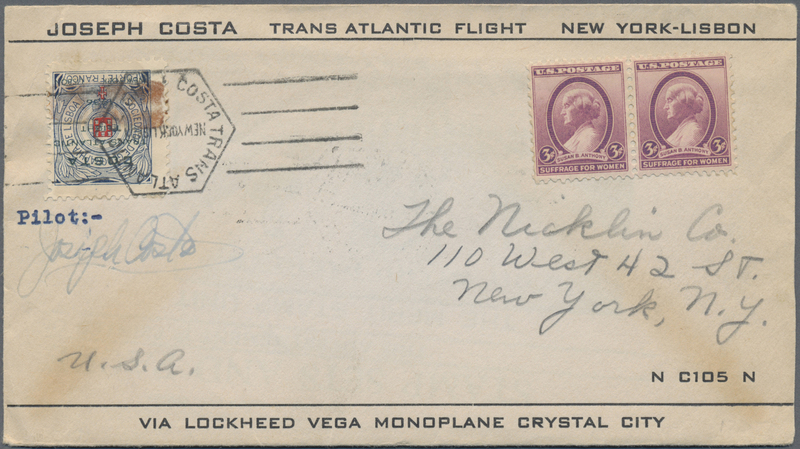 to Cali. 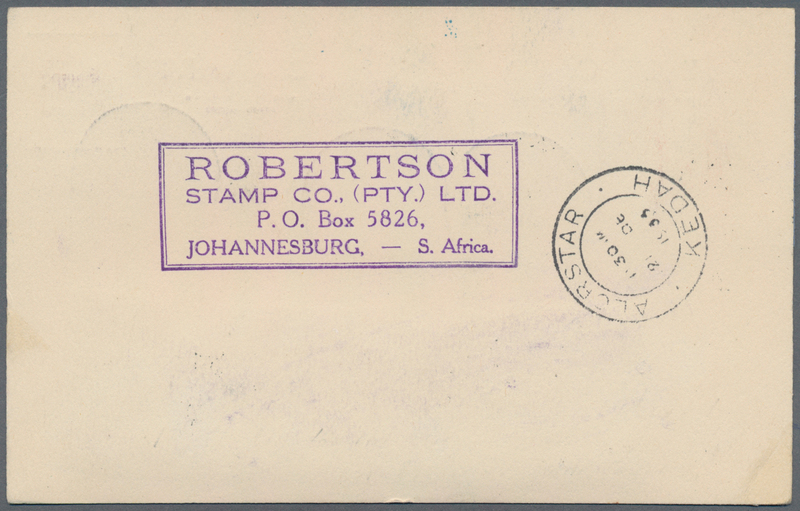 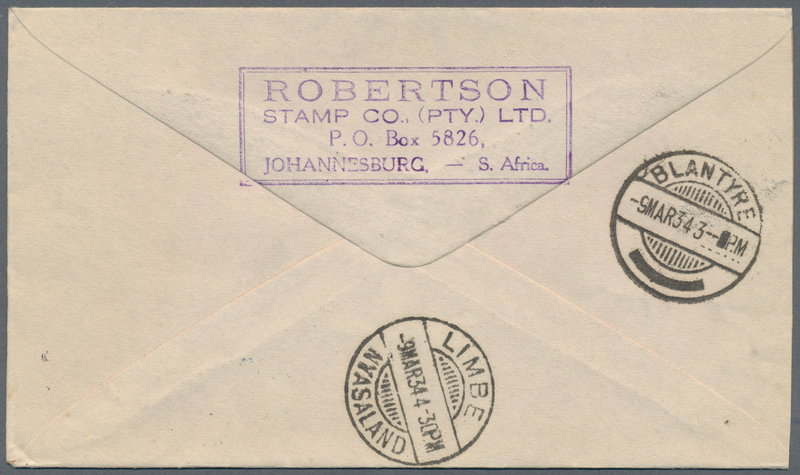 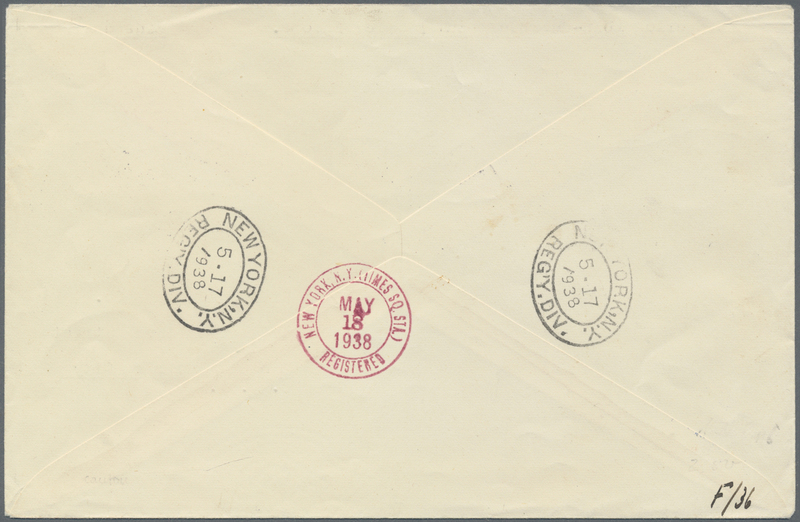 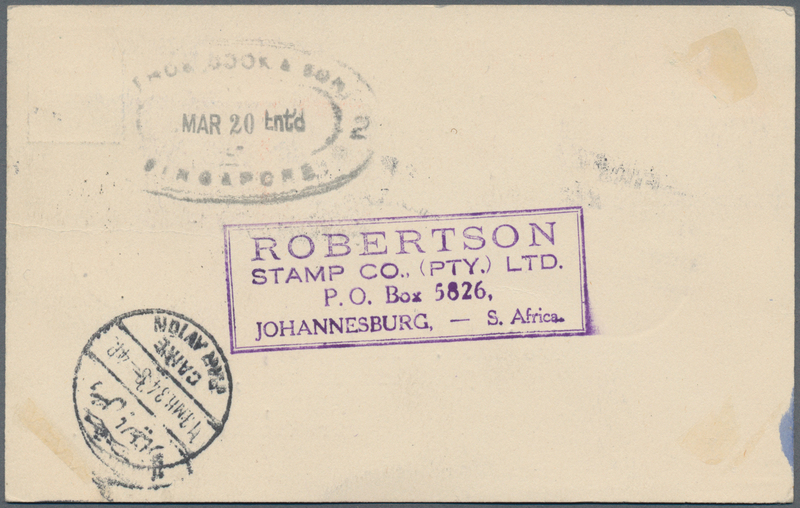 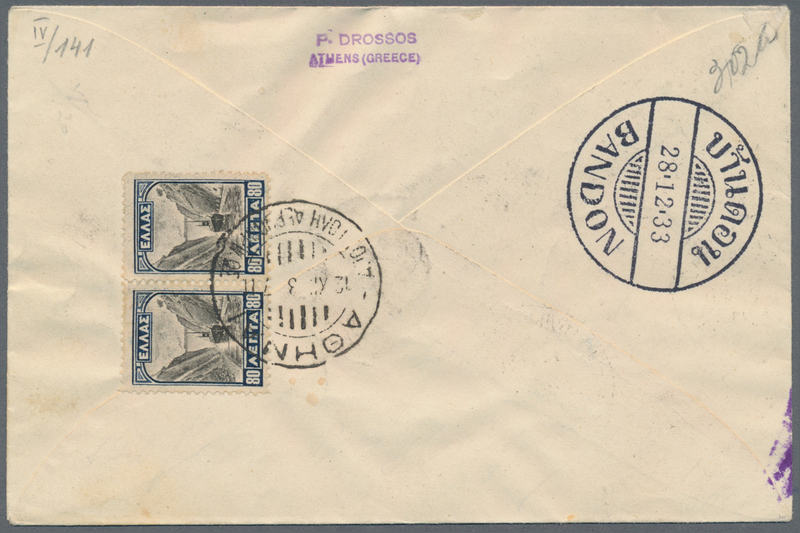 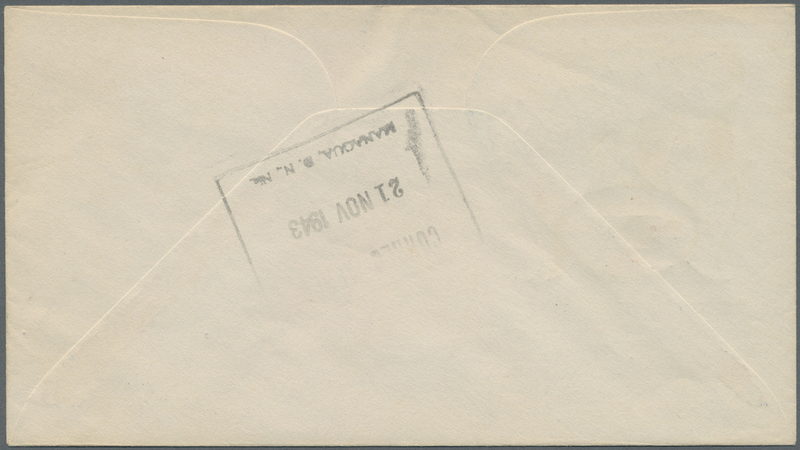 Cover filed bend not affecting stamps. 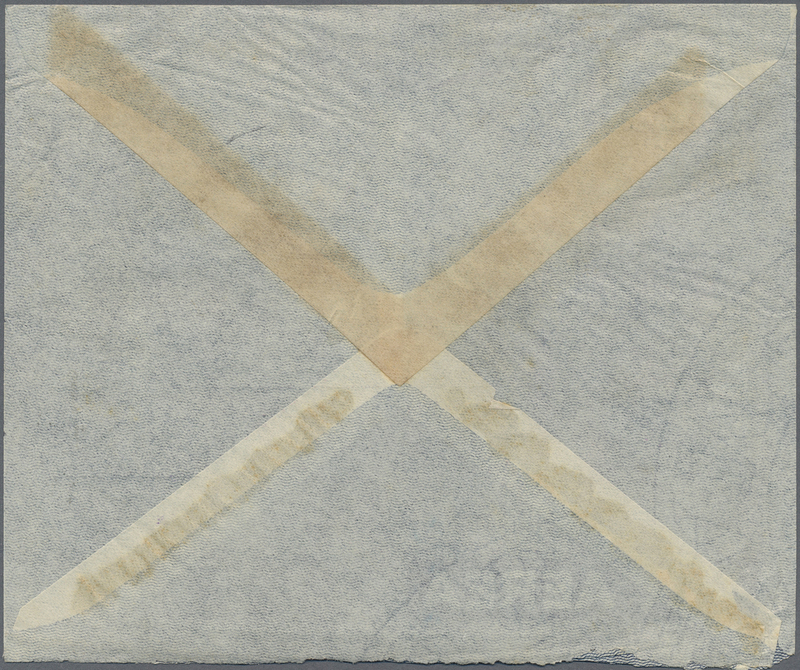 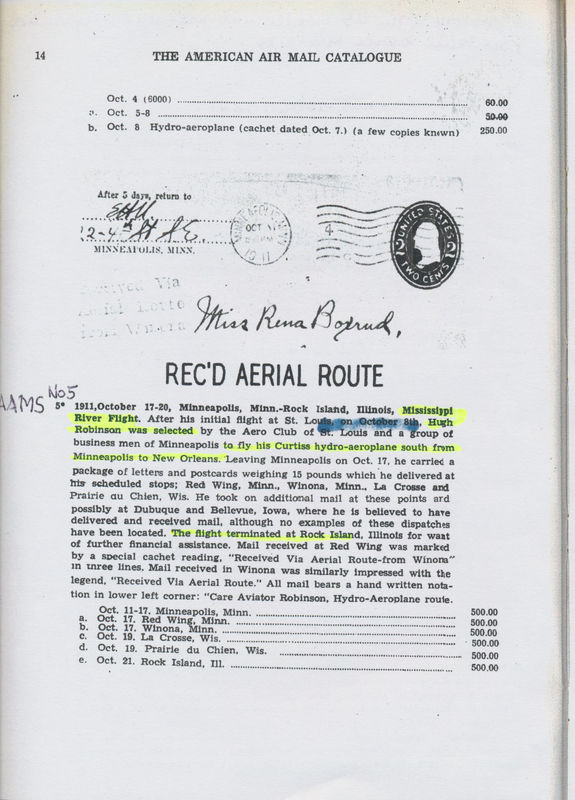 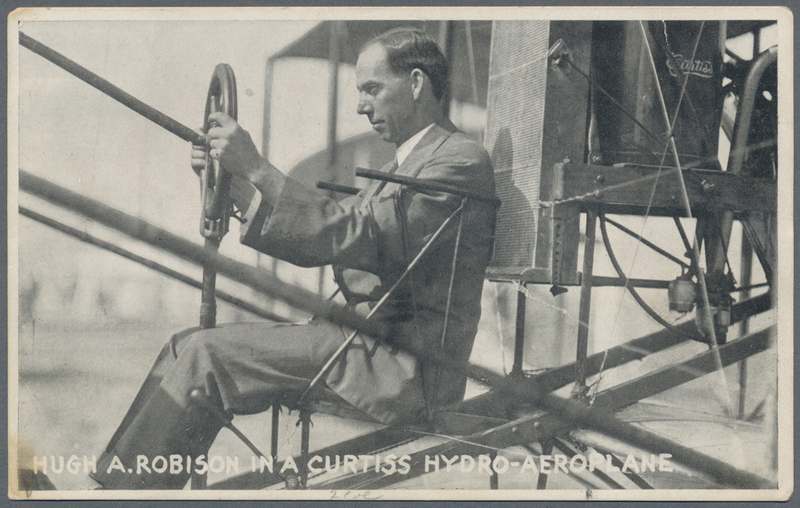 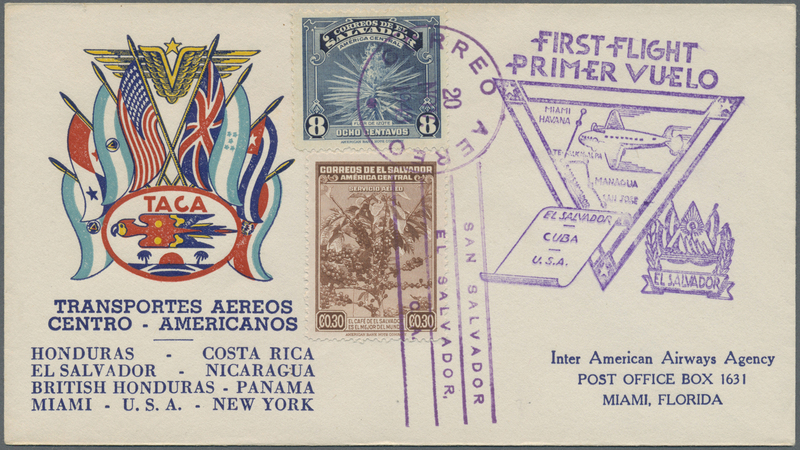 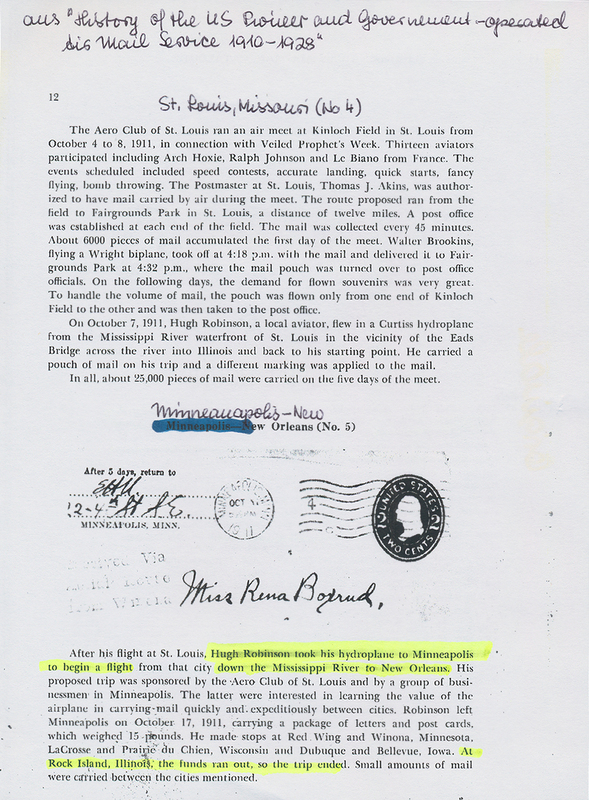 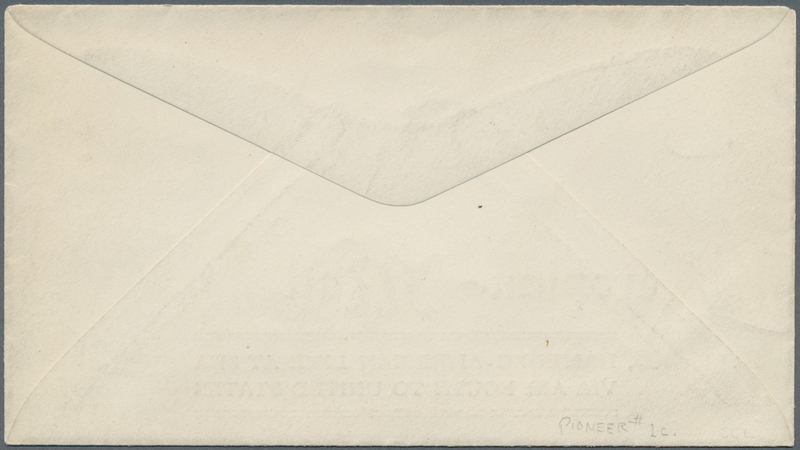 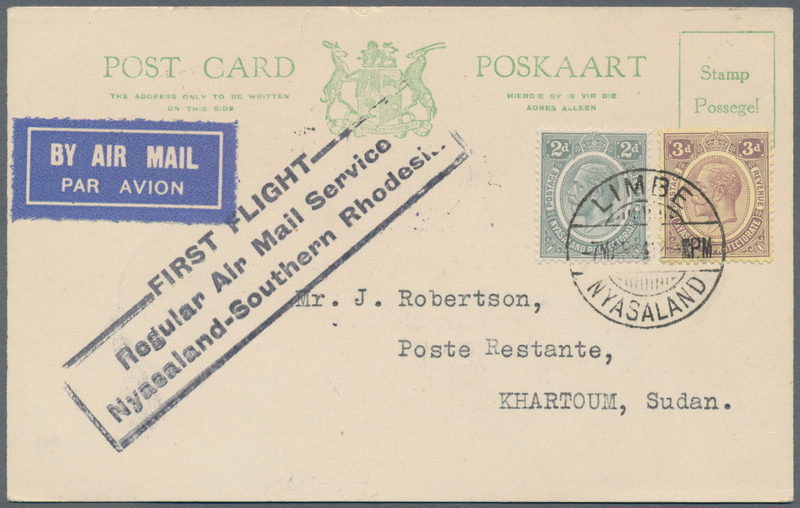 A very scarce flown acceptance. 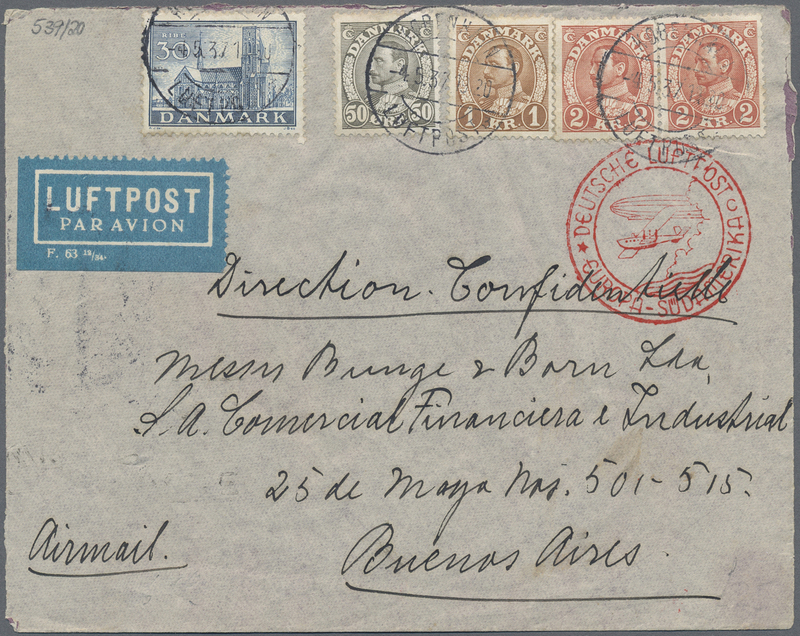 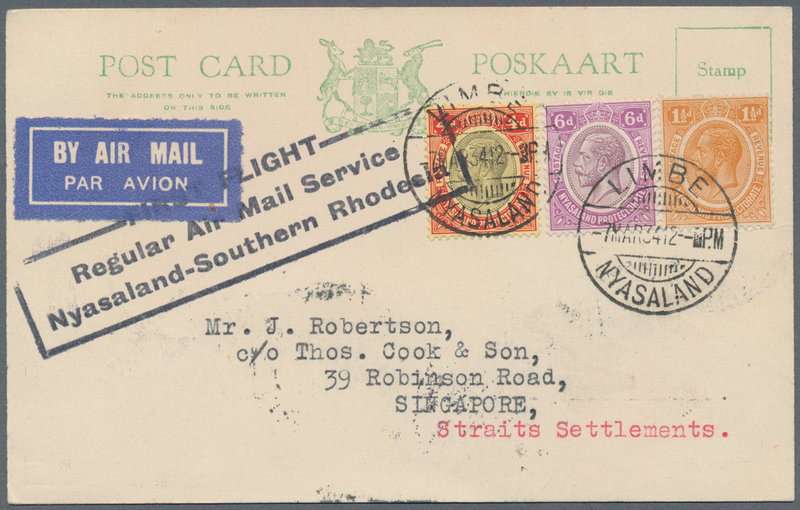 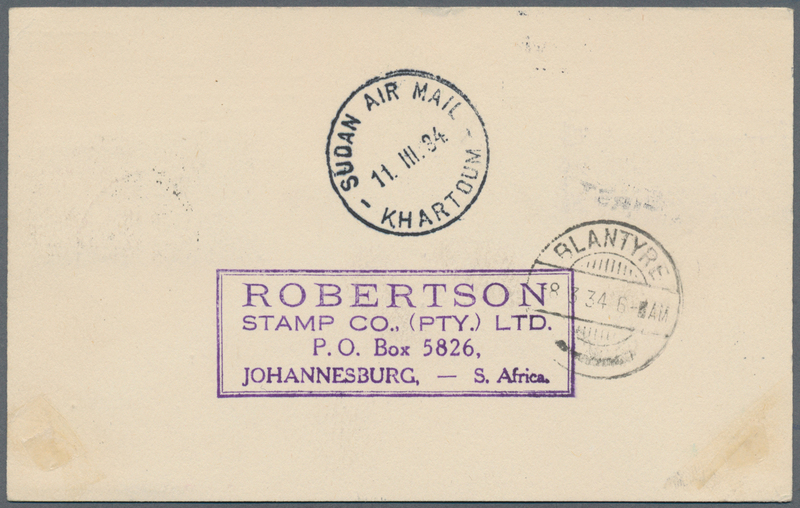 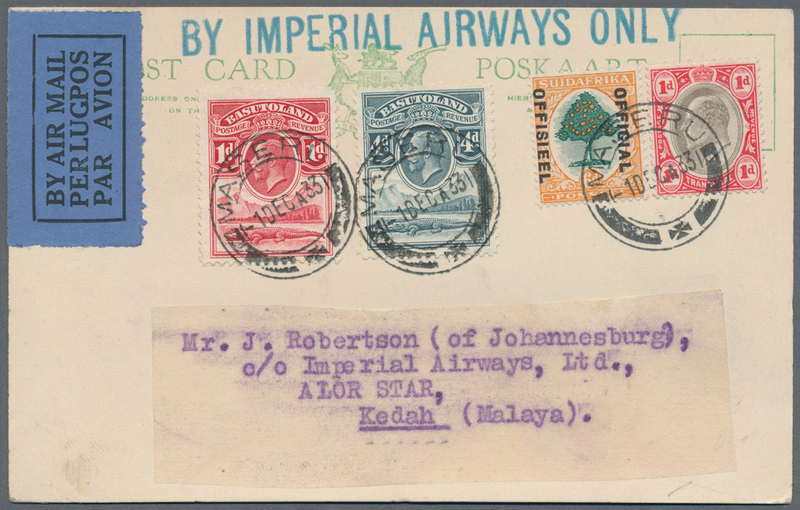 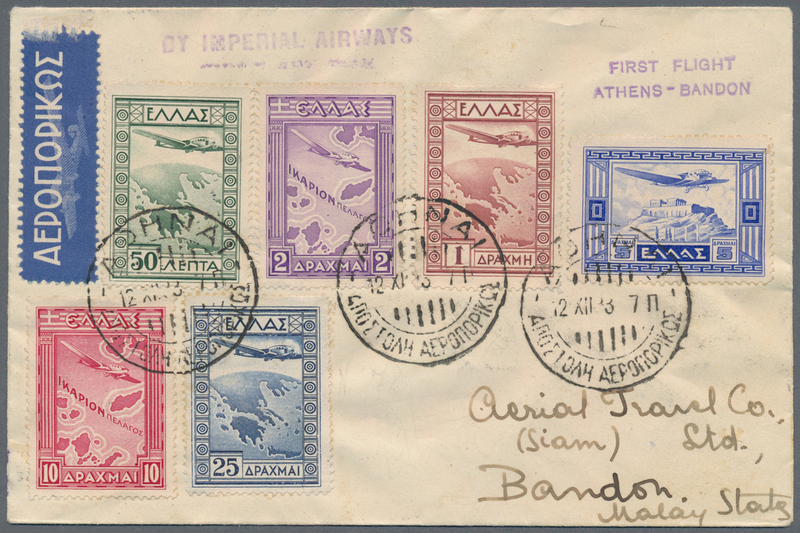 13294 Brief (cover) 1933: Letter from London to Rangoon with "First Regular Air Mail Service by Imperial Airways and Indian Trans-Continental Airways between London and Ragoon", redirected back to London with "First Regular Air Mail Service by Indian Trans-Continental and Imperial Airways Ragoon - Karachi - London". 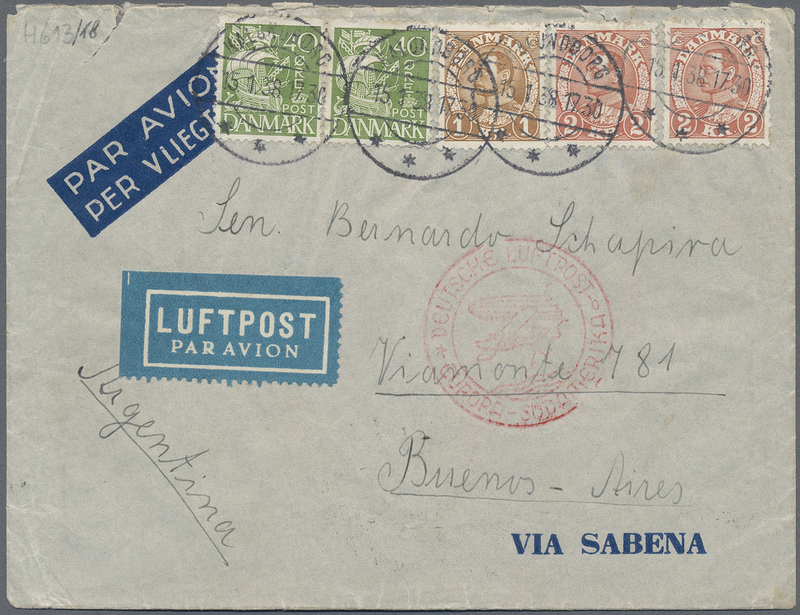 Two First Flights on one cover! 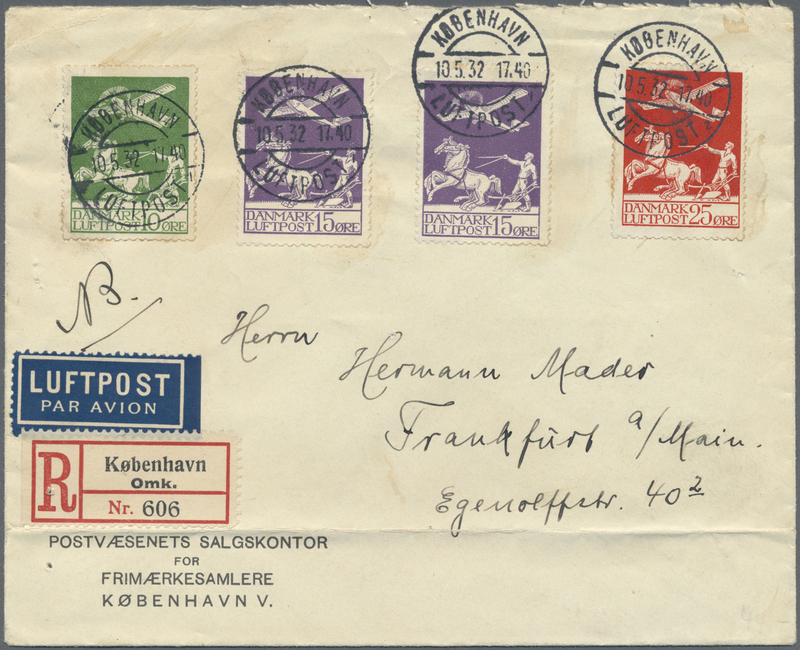 13302 Brief (cover) 1930. 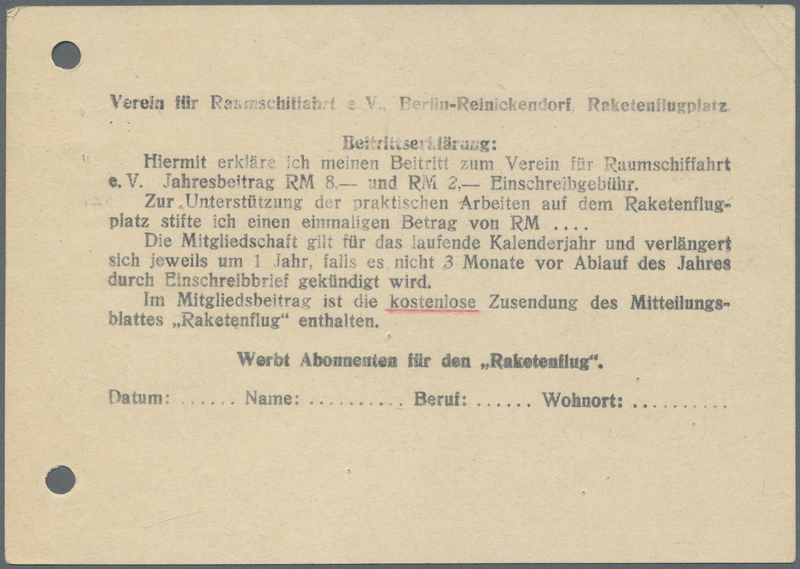 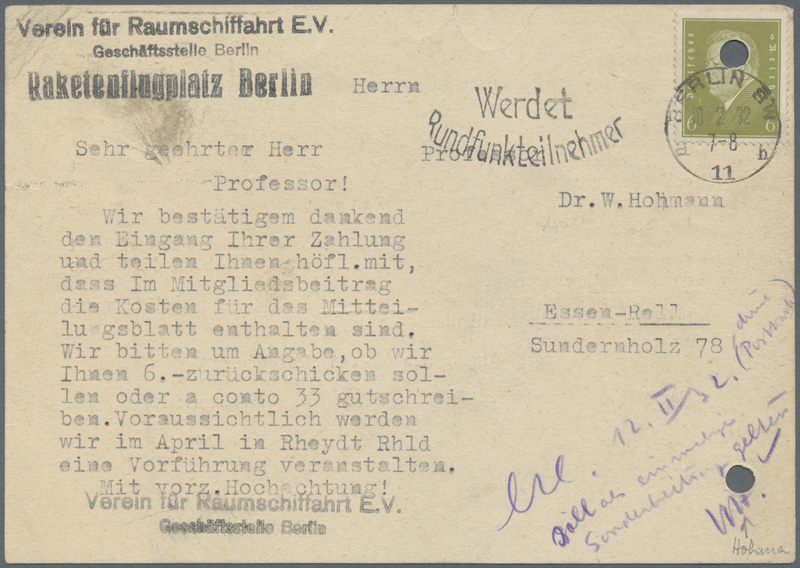 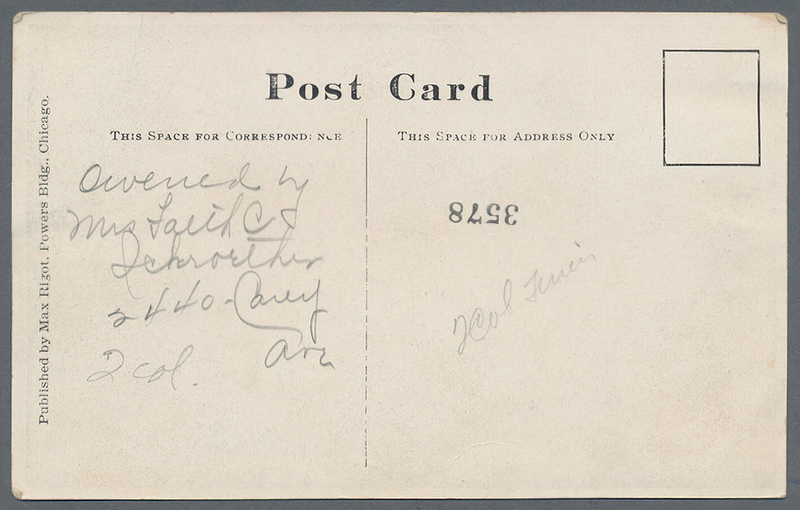 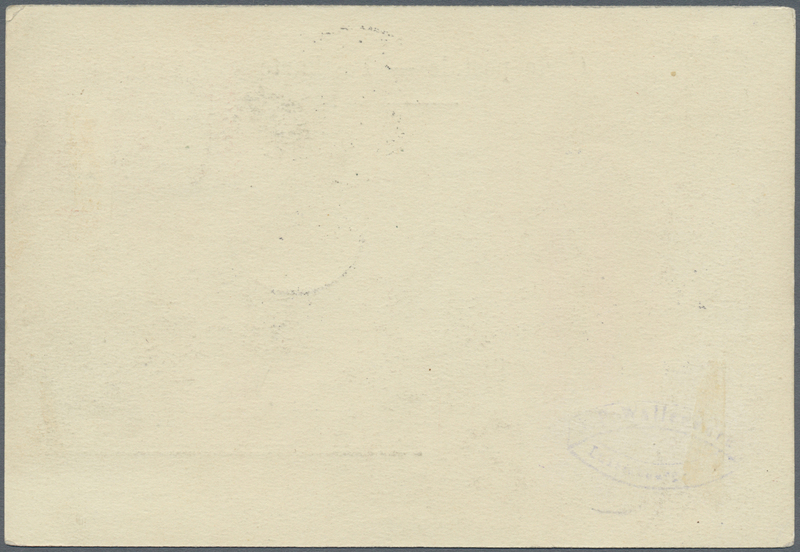 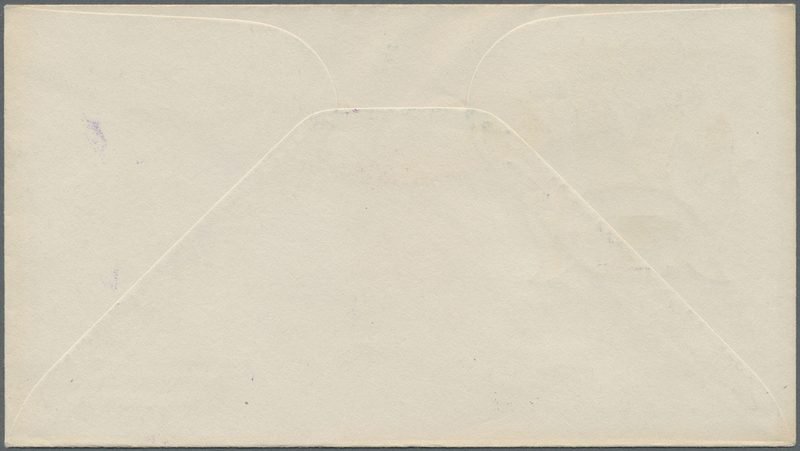 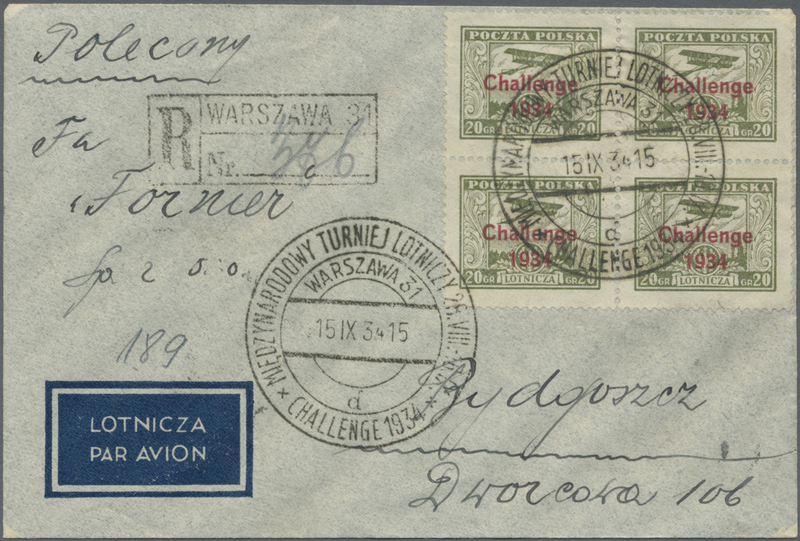 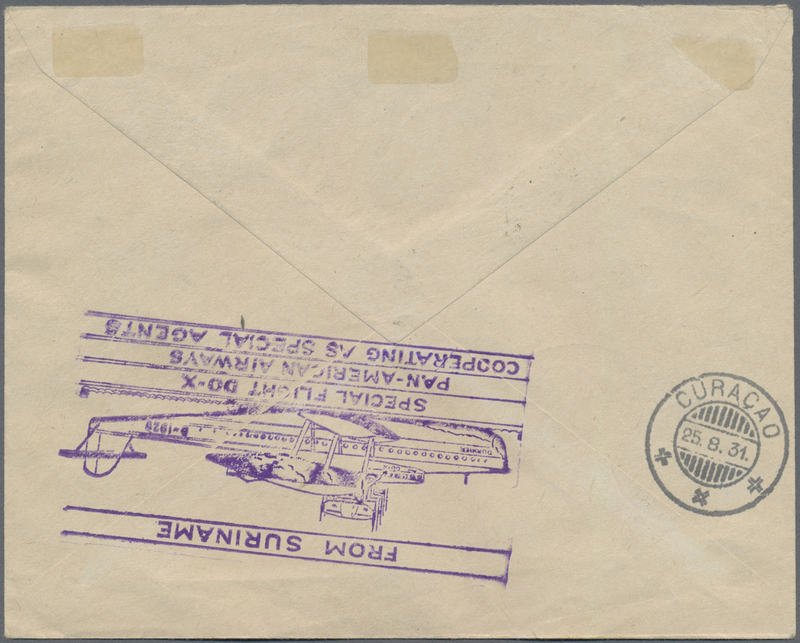 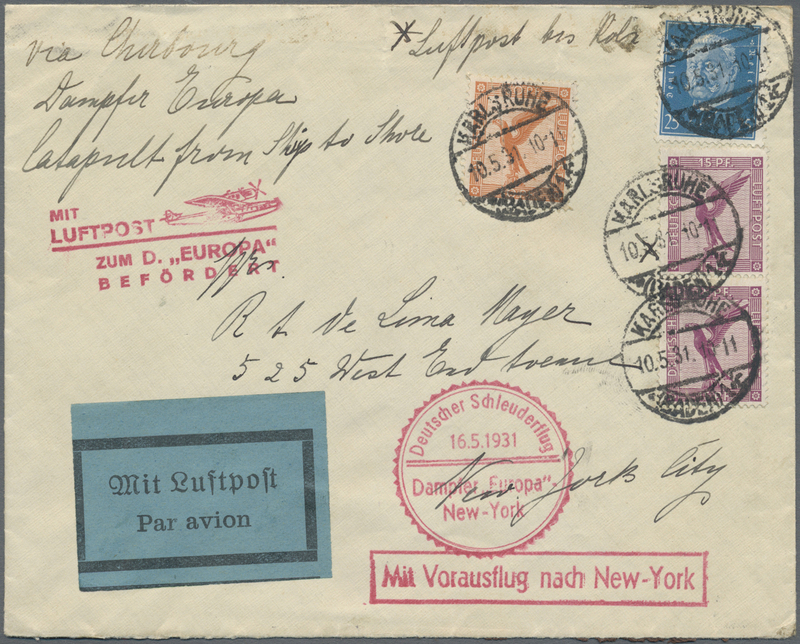 Flown Dornier DO-X card from Dresden to Lansdowne, Philadelphia via Brazil and Ocean City, NJ. 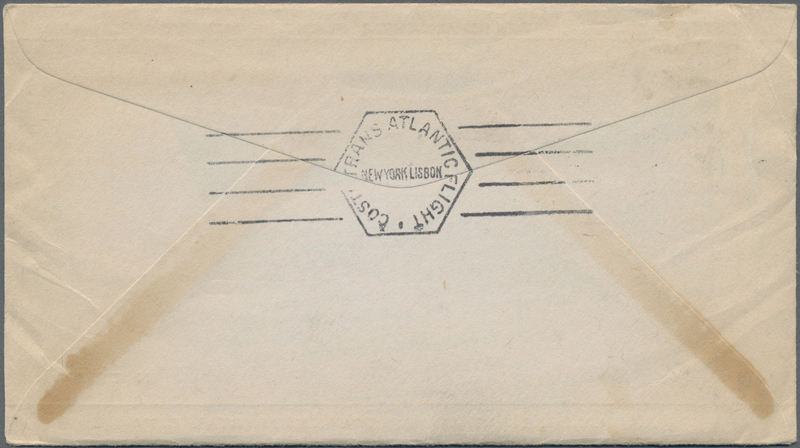 With Lansdowne July 8 receiver reverse. 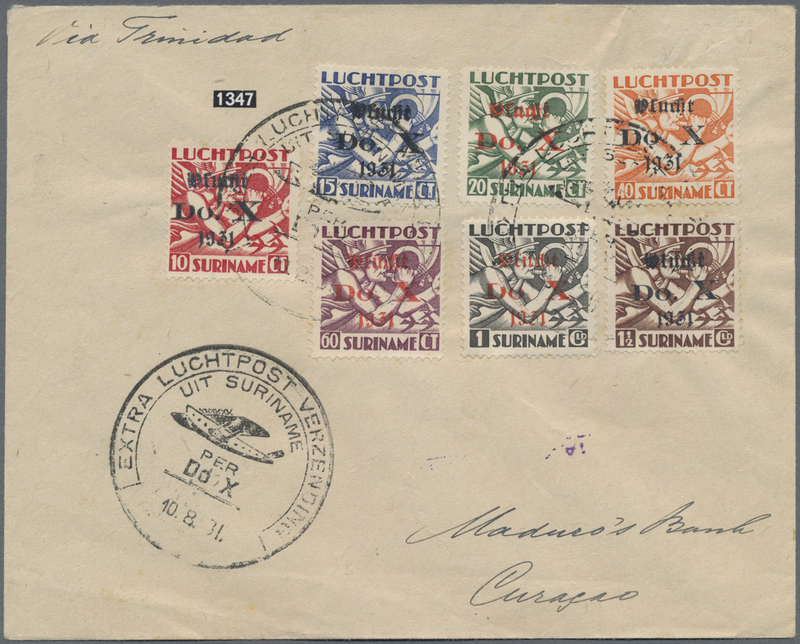 A bit worn, good condition. 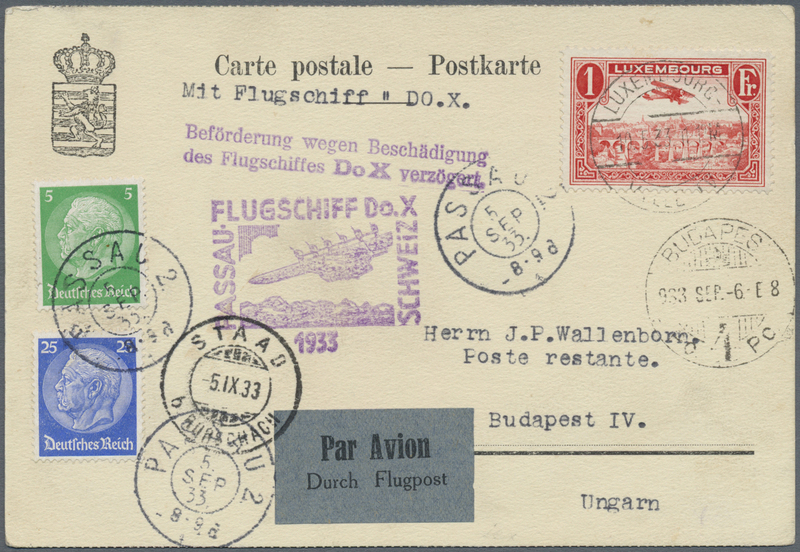 Canceled in Friedrichshafen cancel in November 1930, and with Dornier DO-X double-circle CDS from Jan 30, 1931. 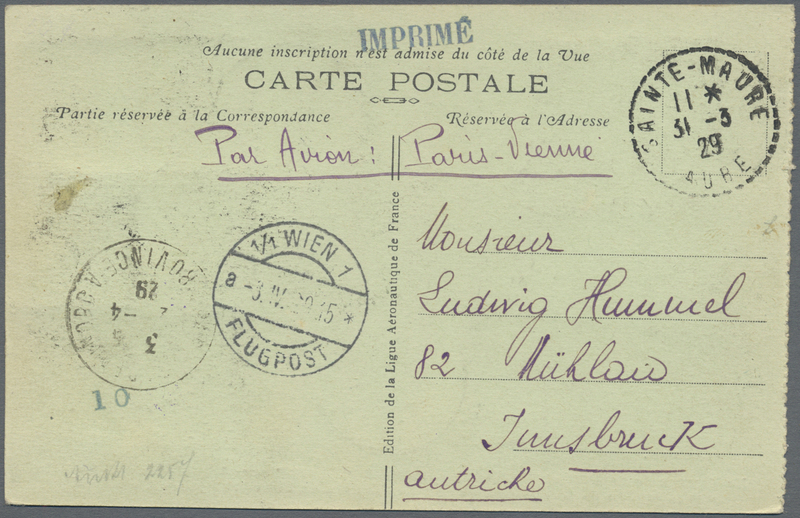 Took quite a long time to get from one place to the other. 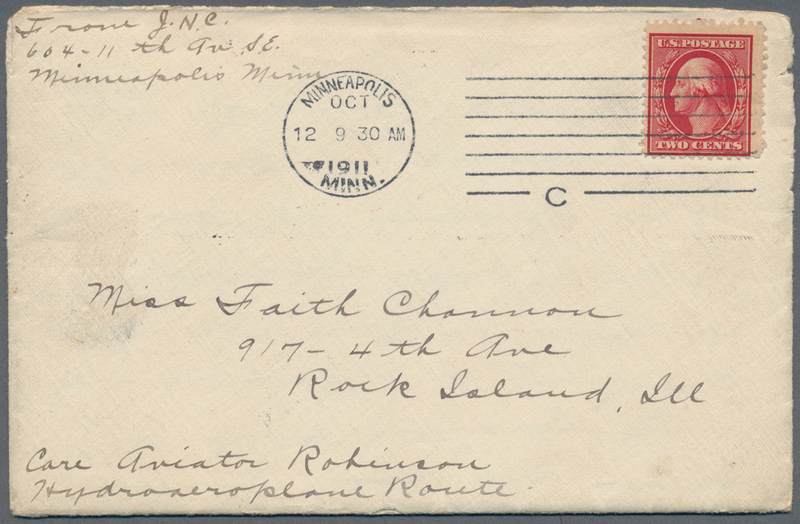 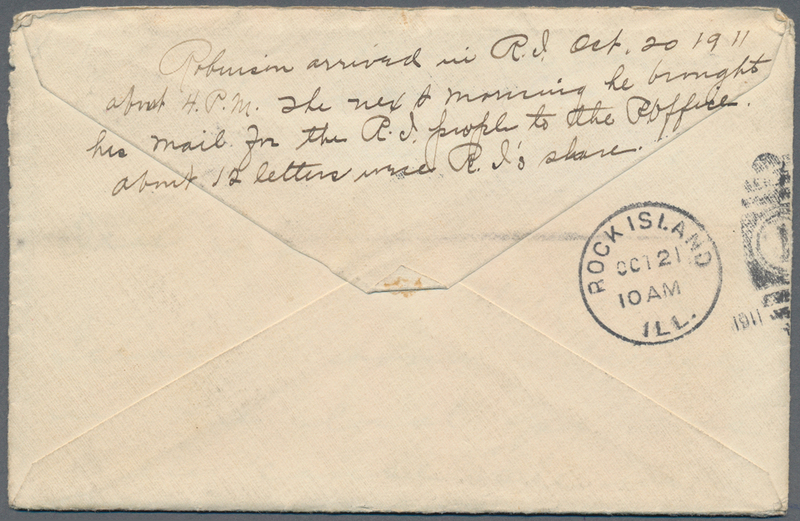 Good 4RM Zeppelin single franking. 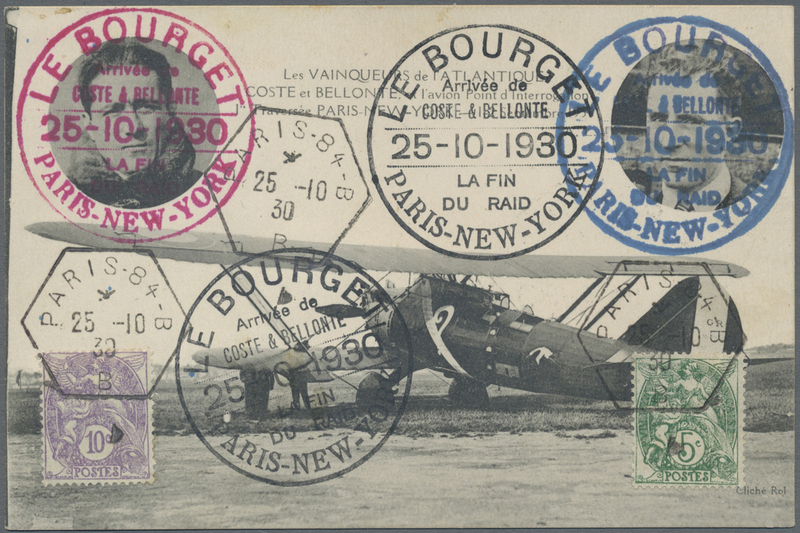 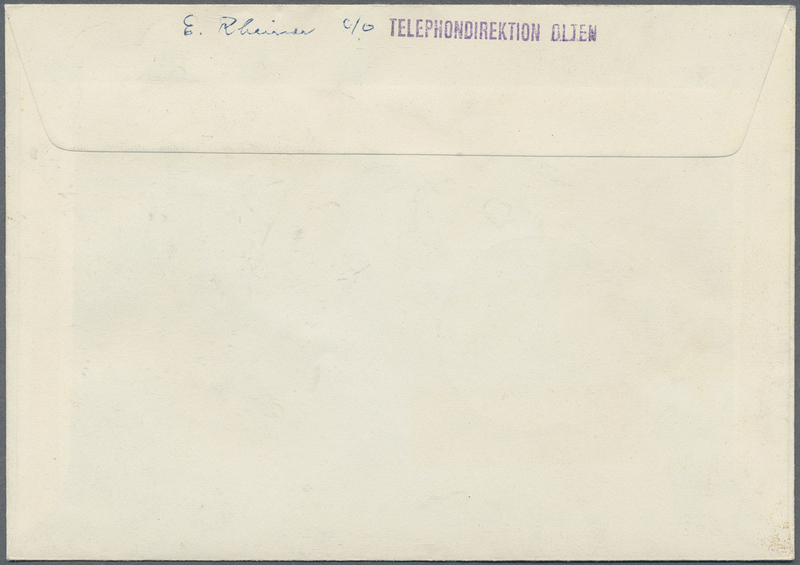 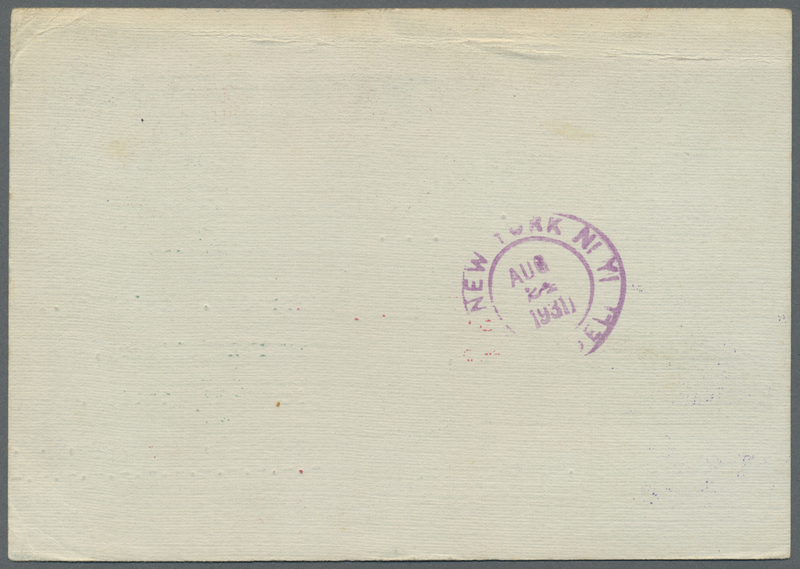 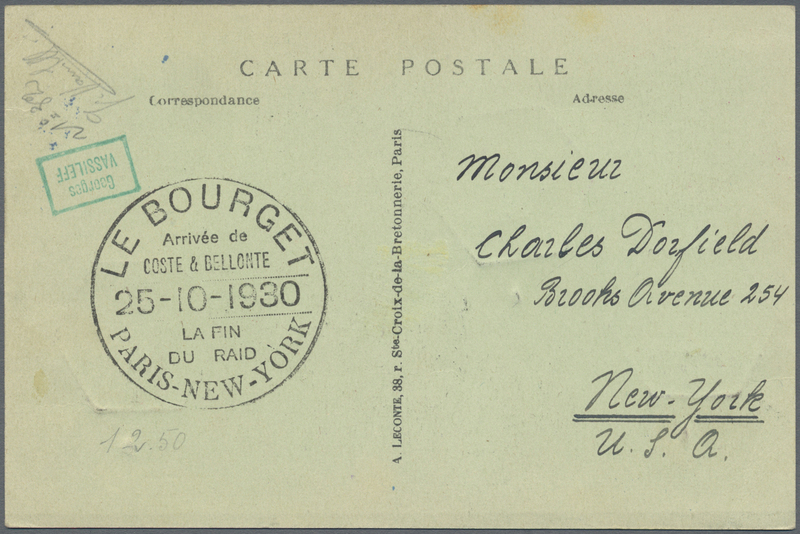 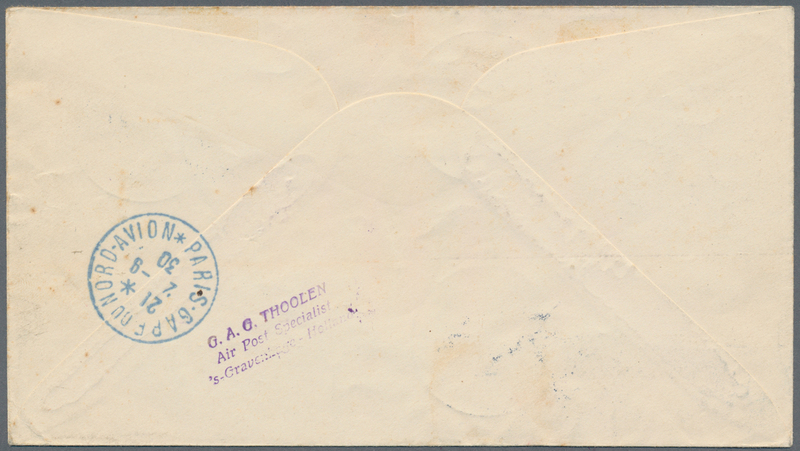 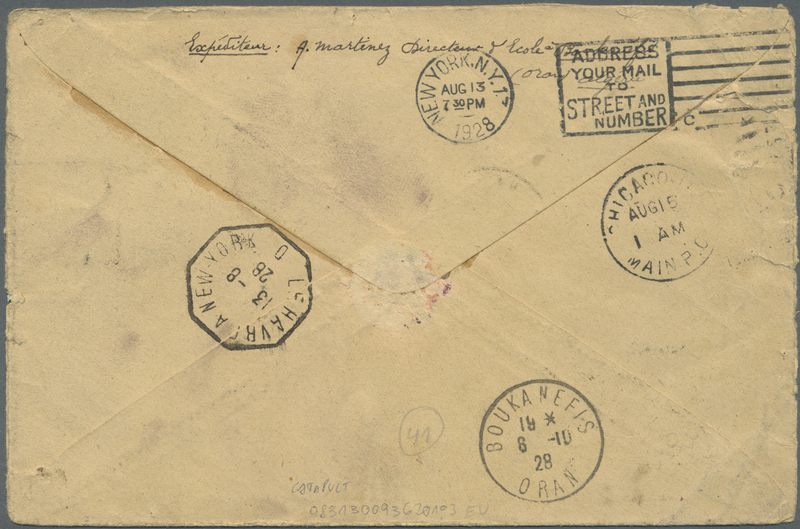 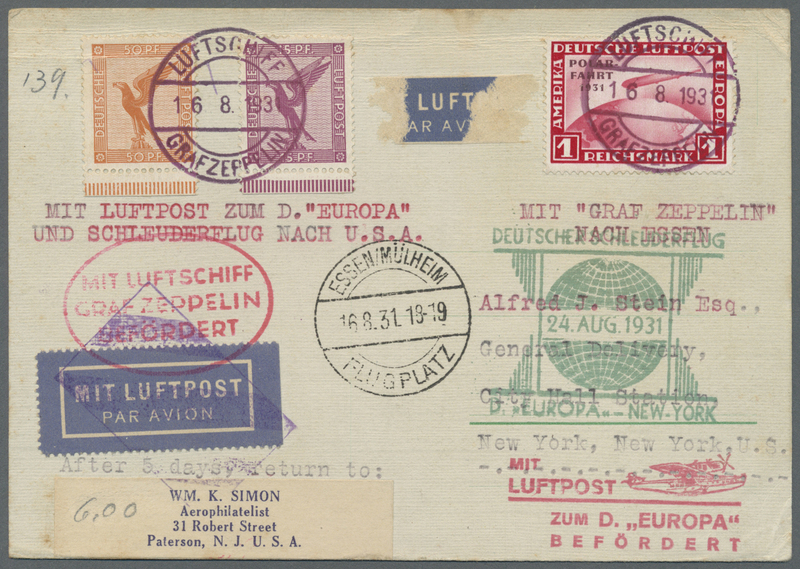 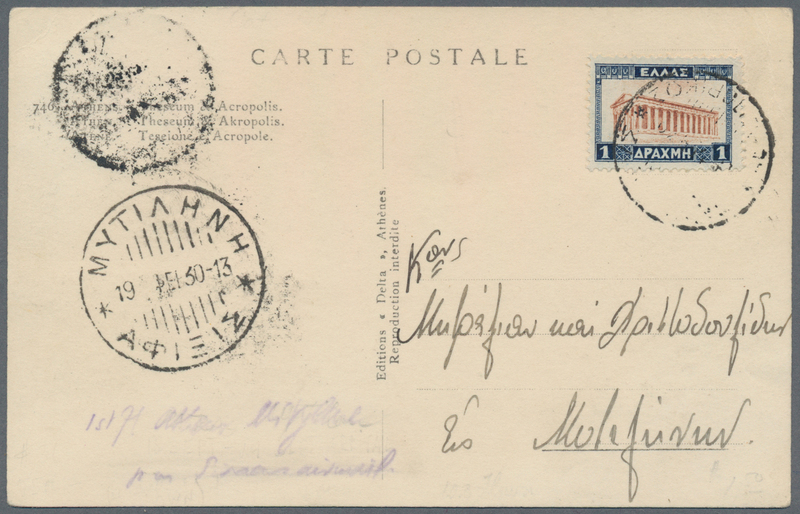 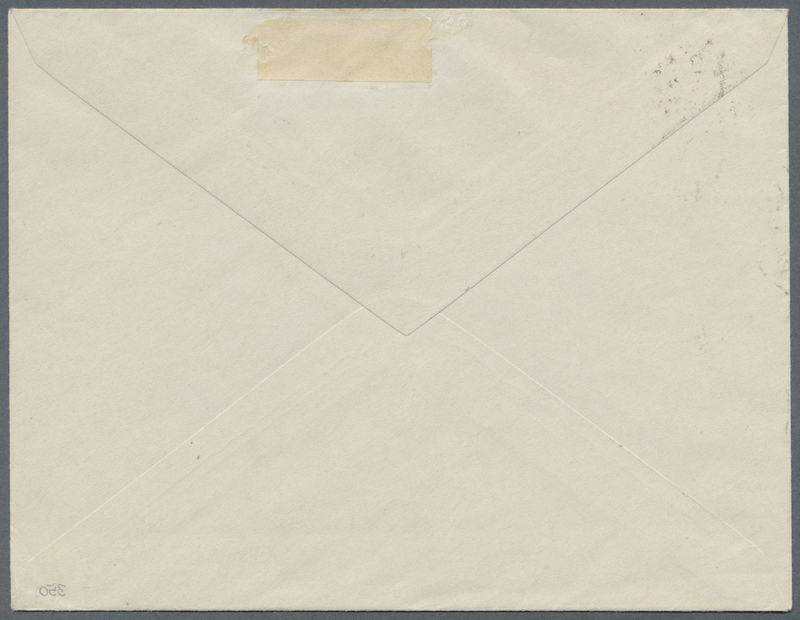 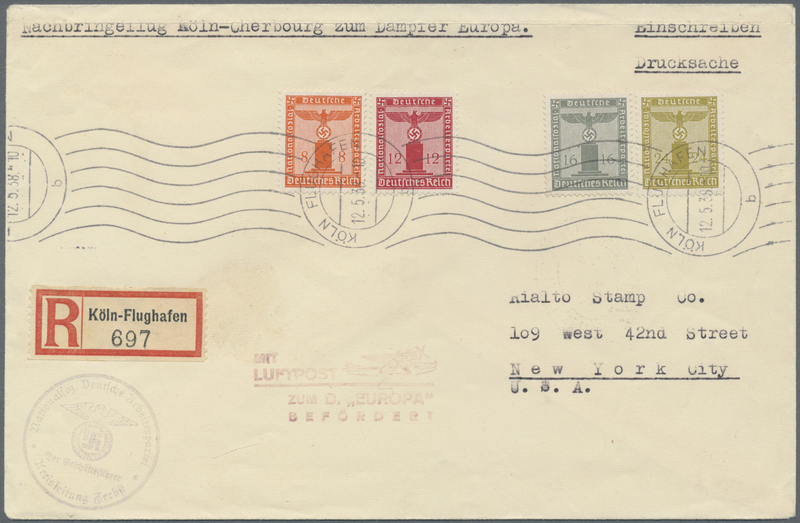 13311 Brief (cover) 1932, BELGIEN/DT.SCHLEUDERFLUG D.EUROPA-NEW YORK 2./3.8. 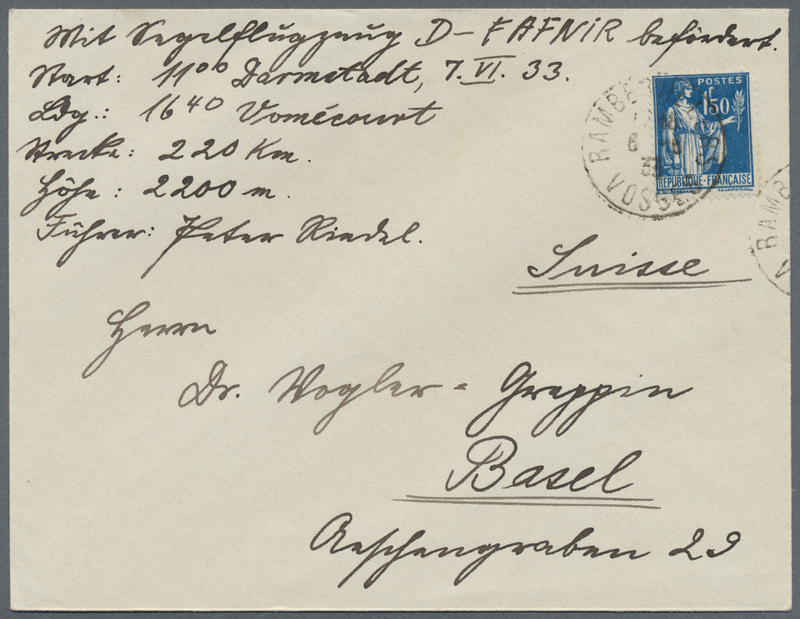 : Äußerst seltene Mitläuferpost mit B/DR-Mischfrankatur ab Deurne über Köln nach New York, das laut Katalog einzig bekannte Stück (HA 97 B/Lp).